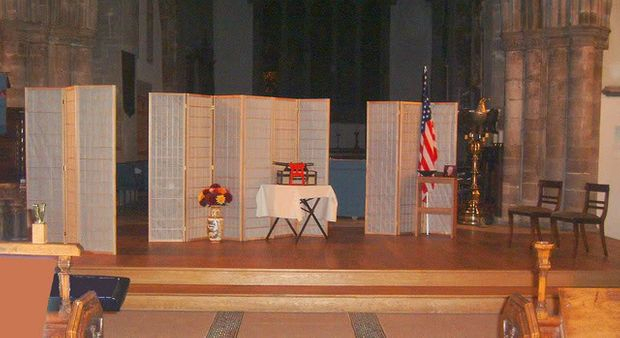 I was very pleasantly surprised by how well operahouse's semi-staged production of Puccini's Madame Butterfly worked at All Saints Church in Loughborough. With simple but very effective staging, props and costumes they managed to bring the drama to life extremely convincingly. The story of Cio Cio San, the Madame Butterfly of the title, the Japanese girl who marries and American sailor as a fashion whim is well known and resurfaced in the theatre as Miss Saigon. What is perhaps not so well known is the music - apart from the aria Un Bel Di (One Fine Day) Butterfly's aria of hope in the face of adversity, and may be the closest that Puccini came to writing a mad scene! Indeed the opera belongs to Butterfly. Once she arrives, she is rarely off the stage and seldom silent. Clare Proctor showed that she was more than up to the requirements of this extensive and demanding role. Lyndon Gardner took the role of Butterfly's husband, Pinkerton and it was a thoughtful interpretation of the role, particularly the remorse shown towards the end. The role of Sharpless, the Consul suited Alan Speight particularly well, and his rich baritone and steady, sympathetic character worked well against the other principals. 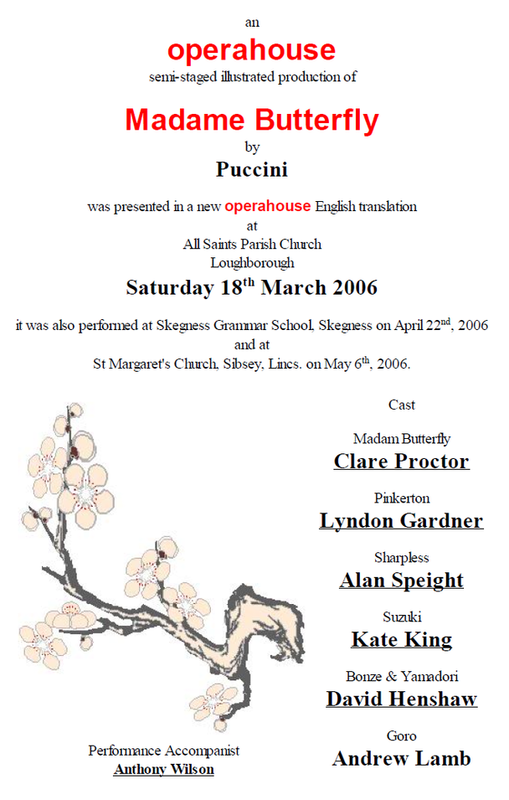 Kate King made an impressive debut with the company, in the role of Suzuki, coping well with the challenge of being on stage for much of the opera, although not always singing. Those who saw operahouse's last production of Tosca will remember both Andrew Lamb and David Henshaw who returned to sing the roles of Goro, The Bonze and Yamadori respectively. Both singers possess warm voices that a venue such as All Saints calls for. Mention must also be given to Paul Blakemore who, as well as having a cameo role as the Commissioner, served as narrator for the evening. Accompaniment came from Anthony Wilson, playing the score on the piano. One did begin to wonder at times if he had 12 fingers, such was the quality of the playing. Finally, operahouse gave a new 'take' on the opera and the traditional ending, which will have had those who knew the opera well questioning their deeply held beliefs and assumptions of Butterfly's fate. Certainly on their way out, several audience members were discussing their perception of the enigmatic ending as, I guess, operahouse intended. Operahouse is a small group whose ambition is to take grand opera to the people. 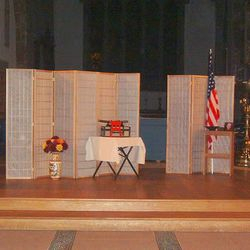 Its cut-down versions with minimal setting can be adapted for a variety of venues. Where it doesn't cut corners is on vocal quality. The singers are in constant demand on the professional and amateur stage. This new translation takes Puccini's Madame Butterfly back to its original source, Pierre Loti's Madame Chrysantheme, moves it to San Francisco and gives the ending a surprising twist. Performed without chorus, we are left with a streamlined production which features the highlights of the opera, interspersed with narrative. 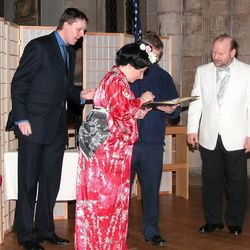 US Naval officer Pinkerton marries Cio-Cio-San (Butterfly) more as a business arrangement than from love. Butterfly, though, determines to adapt to American life. Her vows are a question of honour. Clare Proctor is on form as Butterfly, shown to her best in the aria "One Fine Day", Lyndon Gardner lends his fine tenor to Pinkerton, and Alan Speight impressed as Sharpless. Piano accompanist Anthony Wilson gave valuable support and Paul Blakemore's narration struck a nice balance.